The Milwaukee Bucks are offering free tickets to Wisconsin military veterans under Milwaukee County's Purple Heart Pass Program. Milwaukee County's Purple Heart Pass program was started in 2013 by Milwaukee County Executive Chris Abele and the Milwaukee County Veterans Service Office as a way to recognize that award by granting Wisconsin's Purple Heart recipients a free pass to some of Milwaukee County's world class attractions. 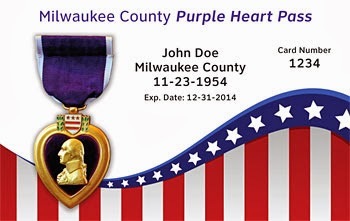 Any veteran in Wisconsin who has received a Purple Heart decoration is eligible for the pass. The Milwaukee County Veterans Service Office (MCVSO) will administer the pass, verifying eligibility through military service records. Purple Heart Veterans can contact MCVSO Director Jim Duff via phone (414.266.1235) or email (jduff@milwcnty.com) for more information on obtaining a pass. The Bucks are donating tickets to the game against the Denver Nuggets on Thursday night at the BMO Harris Bradley Center or the game against the Indiana Pacers on Saturday. Any veteran with a Purple Heart Pass can get up to four tickets to one of the games. Since the original six attractions signed on, others outside Milwaukee County have joined the program. The Highground Veterans Memorial Park in Neillsville provides the passholder + guests a free tour of the site. The Wisconsin Maritime Museum, located in Manitowoc, offers free admission year-round to the passholder +1 guest. Road America is offering free admission to the passholder +1 to two of its more popular races, the June Sprints and the 50th Sports Car Club of American National Runoffs in September. And of course now the Bucks join in. We applaud the Bucks organization in joining the others who honor this special class of veterans with access to their activities.